This is our new tent, call to make a booking. 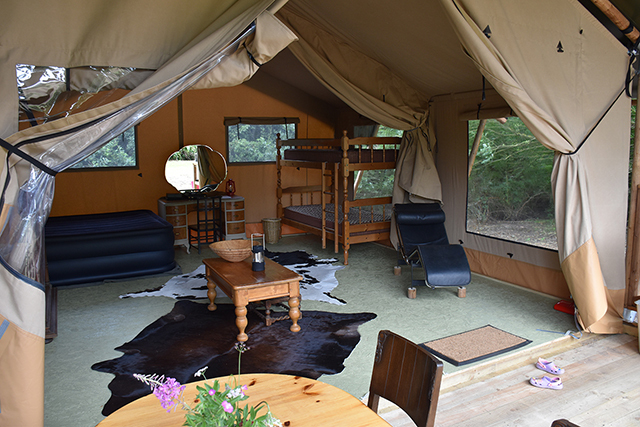 The tent has a wooden floor with a covered veranda at the front. Inside is a bunk bed and an inflatable queen-size bed (soon to be replaced with a four poster bed). At the moment you have to bring your own bedding, pillows, sheets an duvet or sleeping bags. The interior of the tent is “shabby chic” meets “modern camping”. Cow hides on the floor, a leather reclining chair and other ironic furniture. There is a large dining table on the veranda which extends to seat 8 people. There are 6 chairs and two large stools. We also supply the kitchen essentials for cooking, eating, drinking. A two ring gas burner with some pots and pans, utensils etc. Cutlery, plates, cups, mugs and glasses for both water and wine. There are several electric lights inside the tent and a paraffin lamp outside. There are plenty of spare batteries for the electric ones. There is a campfire next to the tent for cooking “camp style” or for just sitting on the covered veranda in the evening. The loo and shower is about 150yrds from the tent but the tent does have it’s own standpipe for fresh drinking water about 30 feet away. I’ve attached a photo of our new shower but the website has pictures of the old brickyard bucket shower as well. We sell firewood in respectable sized bags for £10 and you’re welcome to augment this with any dead wood you can find on site. We will give you a bag of firewood to get you started.